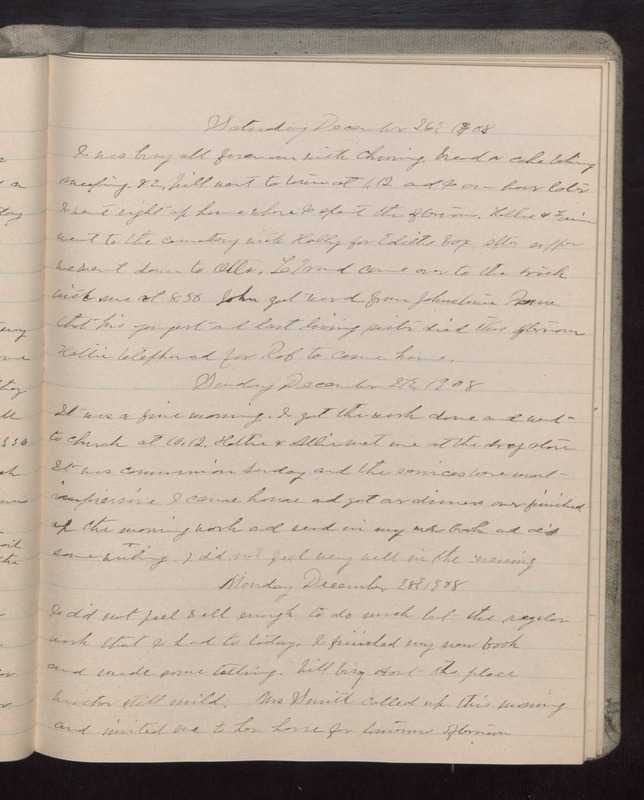 Saturday December 26 1908 I was busy all forenoon with churning, bread & cake baking, sweeping, etc. Will went to town at 1.12 and I an hour later I went right up home where I spent the afternoon. Hattie & Fannie went to the cemetery with Holly for Ediths box. after supper we went down to Otts. LeGrand came over to the [track?] with me at 8.30. John got word from Johnstown [illegible] that his youngest and last living sister died this afternoon. Hattie telephoned for Rob to come home. Sunday December 27 1908 It was a fine morning. I got the work done and went to church at 10.12. Hattie & Allie met me at the drug store It was communion Sunday and the services were most impressive. I came home got our dinners over finished up the morning work and read in my new book and did some writing. I did not feel very well in the evening. Monday December 28 1908 I did not feel well enough to do much but the regular work that I had to today. I finished my new book and made some tatting. Will busy about the place Weather still mild. Mrs Smith called up this morning and invited me to her house for tomorrow afternoon.